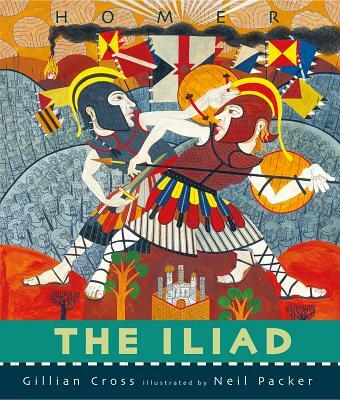 A strikingly illustrated retelling of Homer’s classic from the team who brought us The Odyssey—Carnegie Medalist Gillian Cross and illustrator Neil Packer. After nine years of war between the Greeks and Trojans, tensions are heating up among men of the same faction as well as those on opposing sides. Two proud and powerful Greeks, King Agamemnon and legendary warrior Achilles, quarrel over a beautiful maiden, causing Achilles and his myrmidons to drop out of the fight. Meanwhile, fueled by rage and pride, honor and greed, soldiers on both sides—Odysseus and Patroclus for the Greeks, Paris and Hector for the Trojans—perform heroic deeds, attempting to end the war. Depicting their actions, and those of the gods they invoke, are vivid, stylistic illustrations reminiscent of Greek pottery, giving this large-format volume an extra measure of authenticity and appeal. Gillian Cross, the Carnegie Medal–winning author of Wolf, wrote a retelling of The Odyssey illustrated by Neil Packer. She lives in England. Neil Packer is the illustrator of several classic books, including One Hundred Years of Solitude and Gillian Cross’s retelling of The Odyssey. He lives in London. The content and the imagery are appropriate for readers who need something more serious than sanitized versions but who might be a few years away from more mature-themed retellings...A beautiful, fluid, and action-packed retelling of a timeless classic. Neil Packer’s mesmeric illustrations work here—as they did in his 2012 collaboration with Ms. Cross on “The Odyssey”—to heighten our sense of both the antiquity and immediacy of the Trojan War. That capricious gods would send divine mists or false dreams to affect human battles seems a distant thing; that men fight, sulk and bluster is as true today as it was 3,000 years ago. Commendably, Ms. Cross minimizes the saga’s gore without losing its force, ferocity or emotional power. An eye- catching introduction to the classic story. The narrative of the Trojan War will appeal to readers who want to know more about the ancient Greek gods and heroes...Cartoons throughout are detailed and stylized in an earthy palette reminiscent of scenes incised on ancient Greek stoneware. With lucid prose and admirable pacing, this handsomely designed followup to Cross’ adaptation of The Odyssey (BCCB 11/12) fills in the story for readers who may only be familiar with the names of Helen of Troy, Achilles, Apollo, etc. ... Young readers struggling to make sense of humanity’s insatiable lust for war will find Cross and Packer’s accessible retelling of this classic a cogent guide.